Lynxes live in the boreal forests of North America and in the Canadian Rockies. 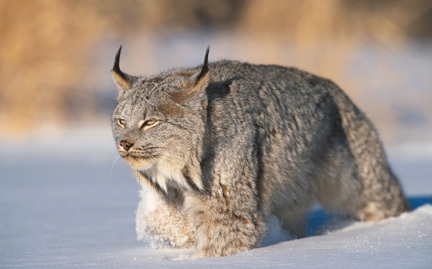 Cousin to the bobcat, the lynx is characterized by its short body, tufted ears and cheek ruffs. Their paws are large and furry, which evenly distributes their weight while moving over snow. Lynxes are at risk due to loss of prey species and hunting for fur.